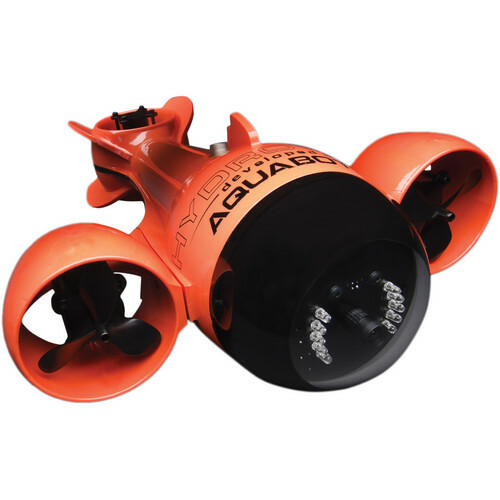 The orange and black HydroView Sport Remote-Controlled Underwater Vehicle from Aquabotix features an LG Electronics F160S camera with a CMOS image sensor. It provides a live video feed to the water's surface and captures HD 1280 x 720/30p video and 1MP photos underwater at a maximum depth of 150'. It has a wide-angle lens with an effective focal length of 3.2mm and a fast f/2.4 maximum aperture for clear low-light shooting. The acrylic dome port for the lens increases the angle of view for wider coverage, to counteract the decrease in coverage that occurs underwater. A highly useful tool for underwater exploration, the HydroView allows you to study marine life and environments and perform inspections under your boat, and can also be employed to check water depths. The vehicle includes a chemical-resistant Cat 5e cable with a length of 75', which can be increased to 150 or 200' via separately available cable extensions to allow you to drive the vehicle further. This cable connects your vehicle to the supplied topside box. The HydroView is actually designed to be able to operate on a cable up to a length of 300'. An 8GB memory card is supplied for recording high-definition video and still images, and a 16 or 32GB card is available separately for capturing 1-2+ hr of HD video. The HydroView is powered by a rechargeable Ni-MH battery pack. Optional propeller covers are available to protect the blades from debris and damage. Various upgrades are sold separately, including an orientation sensor that provides you with readings on yaw, pitch, roll and heading relative to true north. This sensor aids in navigation of the vehicle and is extremely useful in poor water quality conditions. There's also an optional depth sensor that gives you readings on the underwater depth of the vehicle, allowing you to drive it to the exact depth needed for your purposes. This is also a useful tool when you find something underwater that you want to be able to locate again. Also available separately is a sensor that detects and indicates the temperature of the water where the vehicle is swimming. Optional auto controls let you set depth, pitch, heading and thrust. The vehicle's buoyancy is set with salt water use in mind by default. The optional buoyancy management and landing gear system offers manual control over this attribute, allowing you to add weights in order to change the buoyancy to the preferred setting for fresh water or salt water with a lower or higher salinity level. The HydroView Sport gives you the ability to navigate through the water using your iPad or laptop PC as a remote control via 802.11n Wi-Fi connectivity. The box also has a LAN connection enabling the use of an optional Ethernet cable as an alternative to Wi-Fi. The HydroView App for iPad or PC, when coupled with the HydroView software, is used to view the vehicle's live video feed on your iPad or computer's display and control the vehicle's movements and functions. Mac operating systems are not compatible. Can safely be used at a maximum depth of 150'. Provides a live video feed, which can be recorded at resolutions up to HD 1280 x 720p at a rate of 30 fps by the LG Electronics F160S camera, which is connected by USB to the computer inside the vehicle. The camera features a 1MP CMOS image sensor that captures not only the aforementioned video, but also still photos at a maximum resolution of 1280 x 800. It has a wide-angle lens with an effective focal length of 3.2mm and a fast f/2.4 maximum aperture for clear low-light shooting. An 8GB memory card is supplied for recording high-definition video and still images, and a 16 or 32GB card is available separately for capturing 1-2+ hr of HD video. The acrylic dome port for the lens increases the angle of view for wider coverage, to counteract the decrease in coverage that occurs underwater. Runs on rechargeable battery pack, which provides a run time of 2-3 hr and recharges in about 16 hr. The optional high-performance power package gives you up to 50% more thrust and battery life. Set with salt water use in mind by default, though the optional buoyancy management and landing gear system offers manual control over this attribute, allowing you to add weights in order to change the buoyancy to the preferred setting for fresh water or salt water with a lower or higher salinity level. Produces the Wi-Fi signal that allows you to connect your iPad or laptop PC. Mac operating systems are not compatible. The topside box has a LAN connection enabling the use of an optional Ethernet cable as an alternative to Wi-Fi. It is also used to turn the vehicle on/off and recharge the battery inside it. The box is water-resistant and features a watertight connector for attaching the cable that is connected to the vehicle, but is not designed for use in the water. Offer assistance with cable management. They are used to keep the cable closer to the surface of the water to minimize drag. The bobbers also aid in navigation of the vehicle by giving you a sense of its location. On the watertight connector cable, yellow cable bobber attachment indicators make it easy to secure them. To minimize vehicle drag, bobbers should always be placed a few feet above your desired depth. Navigate through the water using your iPad or laptop PC as a remote control via 802.11n Wi-Fi (or LAN connection enabling the use of an optional Ethernet cable), the HydroView software, and the free HydroView App. Mac operating systems are not compatible. Either version is easily downloadable from the Aquabotix website, and the iPad version can also be downloaded from Apple's site. The app is used to view the vehicle's live video feed on your device's display and control the vehicle's movements and functions. The video is visible in the background with the control setting overlays on top. The Dashboard Panel, Depth Meter, Compass and Speed Meter are all software upgrades available at the time of purchase. Control vehicle's 8 LED dome lights, movie recorder, camera, and speed, stop and reverse functions. You can adjust LED brightness and set up the camera to take pictures at an interval you specify. Your recorded videos and photos will be stored on the HydroView, and you can use the free Media Manager app to select which ones you would like to download to your iPad or computer. The app allows you to view, delete and save photos and videos, making it possible to watch and share images without being connected to the HydroView. The iPad version can be downloaded from the Aquabotix website or Apple's store site, while the PC version requires no download and is accessible via the Internet Explorer, Google Chrome, Firefox and Safari web browsers. There are three options for speed: 1/3 power, 2/3 power and full power (see specifications for speeds). When you select one, the vehicle's two forward-facing motors will propel it forward--or backward if Reverse is pressed--and it will remain at that speed until you select another or press STOP. The STOP button halts forward and reverse motion, but you'll still be able to turn, dive or rise until you activate the "LOCK" feature. Used for manipulating motion controls with the iPad and adjusting the camera's focus with either the iPad or PC, and also gives location readings. Auto and manual focus can be selected, and a scroll bar allows you to fine-tune manual focus. With the iPad, you can switch between motion controls (tilting your iPad in the desired direction) and virtual joystick controls to make the vehicle turn left, turn right, dive or rise. The PC version of the app offers keyboard controls for brightness, thrust, pitch (dive/rise) and turn. Within the Configuration Settings menu, there are default settings for these keyboard controls that you can use or change if you want to customize the controls. Available when software has been upgraded to version 5.3 or later, the HUD makes it easy to know where your HydroView is and what it's doing, even when it's outside of visual range. It tracks compass heading, pitch, roll, depth, speed, and vehicle position. HUD components, such as the pitch indicator, depth and speed gauges, can be turned on or off. Use the Invert Steering function to make the vehicle dive and rise in response to the opposite motions. Adjust video resolution with low, medium, high and HD settings. HD delivers the highest quality images at a speed that is slightly slower than a live feed, while high, medium and low resolutions provide images of a lower quality at a faster speed. Also available in the settings menu is the ability to run a vehicle health check, which helps verify that the mechanical components of are functioning properly. If your unit has been upgraded to be equipped with the compass/INS navigation system, it is recommended that you calibrate the compass here in settings once a month, in order to ensure that your sensors are operating with the highest possible accuracy. Orientation sensor provides readings on yaw, pitch, roll and heading relative to true north. Aids in navigation of the vehicle and is extremely useful in poor water quality conditions. Depth sensor gives you readings on the underwater depth of the vehicle, allowing you to drive it to the exact depth needed for your purposes. This is also a useful tool when you find something underwater that you want to be able to locate again. Temperature sensor detects and indicates the temperature of the water where the vehicle is swimming. Let you set depth, pitch, heading and thrust. Computer: Windows 7 or later, or Linux OS with wireless networking capabilities and latest version of Java. Mac operating systems are not compatible. Box Dimensions (LxWxH) 23.0 x 19.0 x 9.0"
What is the physical size? The Aquabotix HydroView Sport Remote-Controlled Underwater Vehicle is 19.5 x 14.5 x 7.0 (49.5 x 36.8 x 17.8 cm). It weights 10 lb (4.5 kg) out of the water. How far can the sub go away from the controller? The Wi-Fi signal is good for about 30 feet. So that is the distance from the Iphone/ipad to the device on the top of the water. Then the wire it comes with is 75 feet and that is attached to the box on the service to the sub. You can also get extensions. And the maximum is 150 feet total for that.There is also an option to use Cat 5e cable from the surface direct to a computer.There are many cables and those can be seen in the product page under accessories/ Sync cords &amp; cables.